Lanzarote is the easternmost island of the Canaries in the Atlantic Ocean, south of the Iberian Peninsula and west of Africa. See the Canary Islands on the map. The Canary Islands form one of the autonomous communities of Spain. Beautiful settings and excellent weather allied to the comfort, accessibility and safety of a European location make the Canaries a perfect year-round tourist destination. Quite a number of interesting sites can be visited on Lanzarote and a simple drive through the island is already worth a try. Read more about main tourist attractions in Lanzarote. Lanzarote, as other Canary Islands is of a volcanic origin and the landscapes of black rock formations and endless almost deserted areas are sometimes compared to the surface of the moon. The ‘lunar’ landscapes of Lanzarote appear even more surreal when contrasted with many paradisiac beaches of turquoise waters that can be found all around the coast. Motorized tourists will need less than a weeks time to visit Lanzarote in a relaxed pace. Although taxis are plentiful in bigger towns and holiday resorts of Lanzarote, taxi fares for travelling to the island’s most remote places can be quite costly. Lanzarote car hire, on the other hand is quite accessible and for many it turns out to be the most comfortable and cost effective solutions to get to know the island. Take advantage of cheap car hire offers in Lanzarote to make the most of your Canary Islands holiday. Best car hire deals in Lanzarote can frequently be found on the internet, by comparing car hire rates from different car rental suppliers. Travellers to Lanzarote can count on a very wide range of car hire solutions. Lanzarote Airport car hire is a popular option and the car rental companies in this location are plentiful. Major rent a car brands, such as Europcar, Hertz and Avis Rent a Car are present at Lanzarote’s only airport, as well as local car hire providers: Auto Reisen, Cicar Canary Islands, Cabrera Medina, Goldcar, Payless Car, Orcar Lanzarote, Betacar, Marbesol and Felycar Lanzarote. Car hire is also available in different locations on the island, usually concentrated in popular beach resort areas and in Lanzarote’s capital, Arrecife. The local Canary Islands brand Cicar, with nine car rental stations across the island is amongst the leading car hire services in Lanzarote. Other popular rent a car companies, to be found in Playa Blanca, Puerto del Carmen, Costa Teguise and Arrecife are: Hertz, Alamo, Europcar, Avis Rent a Car, Auto Reisen and Goldcar Lanzarote. Some major holiday resorts in Lanzarote will provide their own car hire services. Be aware, though, that those tend to offer rental cars at rather inflated prices. In general, the cheapest Lanzarote car hire is found in the airport. Given the great availability of car hire in Lanzarote, many tourist end up renting a car rather spontaneously for an improvised day-trip around the island. The competition between rent a car companies in Lanzarote is fierce. Reasonably priced Lanzarote rental cars can be found by checking the offer of several different providers. To avoid over-paying, though, it is always recommendable to book well in advanced of your Canary Island holiday as the prices increase at the peak of tourist season. With an online search engine of car hire offers, such as Cartrawler, you can often find rental cars with prices starting from £ 80 for a week of Lanzarote car hire. For this price you will get a small city car such as a Citroen C2, the new VW UP, or a similar model. This type of a rental car seems to be extremely popular in Lanzarote; it allows you to travel inexpensively across the island and between the beach resorts. If you are renting the car at Lanzarote Airport, though, and a reasonable cargo space is needed to transport your luggage, aim for larger and more comfortable cars. A 7-days rental of a VW Polo, or a similar vehicle in Lanzarote will usually cost from around £ 95, if booked well in advanced. Rental vehicles for larger groups or families, MPV’s and minibuses in Lanzarote get slightly more expensive and should be booked well ahead of your planned holiday, as they come in a short supply. The price of the cheapest 9-seater, in the form of a Mercedes Vito, VW Caravelle, Citroen Jumpy, or a similar car, starts from approx. £ 330 for a week of car hire in Lanzarote. Not very common as a hire vehicle, a luxury four wheel Range Rover Sport, or a similar vehicle, is usually available from approx. £ 1200 for a week of Lanzarote car hire. A lot cheaper is the Land Rover Freelander, or similar, which is a perfectly good alternative for a 4x4 adventure on Lanzarote mountainous roads. Be aware that with most Lanzarote car hire offers, drivers up to 25 years of age will be charged an additional fee. Check under the ‘Rate details’ of your Cartrawler offer what is the applicable young drivers fee. Most tourists will find driving in Lanzarote rather easy and relaxing. The overall road conditions on the island are good and outside of the big resorts the intensity of traffic is very low. It will take only 1 hour and 15 minutes of a pleasurable drive in interesting scenery to travel between the most distant beach locations of Playa Blanca in the south-west of the island and Orzola in the north-east. 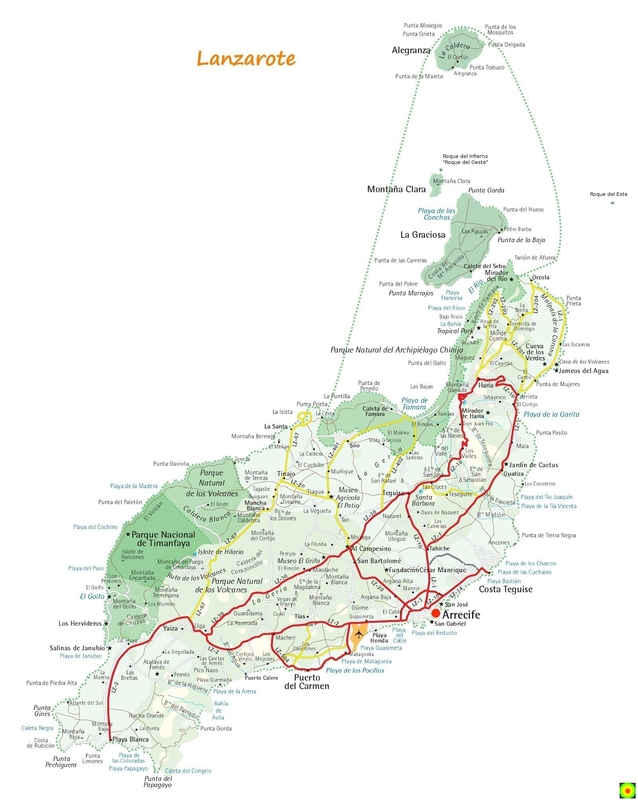 See Lanzarote road map (click to enlarge). Lanzarote is Spanish territory and the road regulations applied are the same as in the continental Spain and most of the European countries. if not indicated differently the speed limits are: 50 km/h (31 mph) in build-up areas and 100 – 110 km/h (62 – 68 mph) on major roads outside build-up areas. seatbelts are mandatory for the driver and passengers, front and rear. use of mobile phones while driving in Lanzarote is strictly forbidden. children up to 12 years of age travel in the back and in proper child seats. an interesting regulation in a popular beach holiday location: driving shoes must have a strap behind the ankle, meaning that no flip-flops are allowed! a valid driver’s licence, an ID document as well as the car insurance documents must be carried by the driver at all times. the minimum driving age in Lanzarote is 18, but you need to be at least 21 to be able to rent a car. Please note that young drivers charges apply in many car hire companies in Lanzarote. drink-driving in Lanzarote: the legal alcohol limit in Lanzarote is the same as in mainland Spain – 0,05%, less than in the UK (0,08%). In Lanzarote you drive on the right hand side and traffic from the right has priority. Lanzarote hire car is a comfortable way of moving around the island and an inexpenssive one, if booked well in advance. Use Cartrawler search engine to get quotes for car rental in Lanzarote. Compare offers from many Canary Islands rent a car companies, amongst them: Europcar, Hertz, Avis Rent a Car, Auto Reisen, Cicar Canary Islands, Cabrera Medina, Goldcar, Payless Car, Orcar Lanzarote, Betacar, Marbesol and Felycar Lanzarote.